Visit certainly could be considered an eclectic studio that produced a catalogue of titles that only could realistically described as experimental in nature. I suspect that this is the reason why the company has subsequently vanished into obscurity. Bizarrely even through the company’s titles were extremely niche in nature they had an appreciative audience as evidenced by many of their patrons commenting on the software, they produced in a positive manner on the company’s BBS board. My opinion about Visit’s catalogue is probably influenced by the fact that the company’s software was exclusive to the Japanese market and had no Western developed equivalent. Even so i’m unaware of any Japanese development studio currently producing similar titles to what Visit’s catalogue contained. I can only assume this is down to simple market economics with a general lack of commercial appeal for repeated entries in incredibly niche & experimental genres. As for Visit themselves outside the archived remains of their official site no trace of their existence really remains of them outside from their published works. There archived official site does thankfully provide a company profile which states that they were established in September ’90 in the Naniwa-Ku district of Osaka, Japan. It also lists their primary business interests as Planning, development and sale of home game software and the company was relatively small with just twenty-one employees in total. A later incarnation of their archived official site features a timeline which mentions that Visit concluded their licensing agreement with Sega in December ’99 and at that time the company became an officially licensed Dreamcast developer. Personally, while my exposure to VISIT’s catalogue is almost exclusively related to their Dreamcast titles if had to speculate i’d hazard a guess that VISIT’s best-known titles or at least well received would either be their Shinri franchise. This had a quite amazing ten instalments in the series or perhaps possibly their PlayStation Last Train sound novel which was re-released as the company’s sole PlayStation 2 title. Visit’s catalogue can only realistically be described as mainly consisting of generally experimental titles lacking overall commercial appeal. This is best summarised with their last title confirmed to be published by the studio which was The Dog Master which was released on the 7th of August ’03 making it a very late release for the original Sony PlayStation. Personally, i suspect The Dog Master was VISIT’s attempt to try to market a more mainstream title with broader commercial appeal. In support of this theory is the choice of format Visit released it on being the original PlayStation which was a strange choice since the company had developed next generation software for both the Dreamcast and the PlayStation 2 systems. I can only assume that the choice to revert to the original PlayStation was probably due in-part because of its large installed user base being the most commercially viable platform for their title to be released on. It appears that after The Dog Master’s release in late ’03 Visit subsequently changed their focus and moved away from their traditional business interest of consumer software development to concentrate on web development & internet solutions for education institutions such as Osaka Sangyo University. 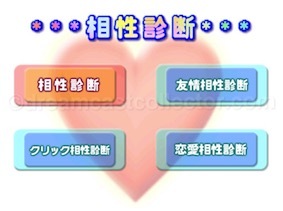 The company continued to provide educational software mainly for different departments of Osaka Sangyo University but later to other educational institutions. Information about this aspect of the company’s business is unfortunately scant to the extent that apart from providing software for the aforementioned Osaka Sangyo University i can’t find any other confirmed information in relation to this new business venture. Strangely given the change of VISIT’s business interests they maintained a website that was still predominantly consumer software focused till around mid ’06. While i can’t be positive i assume that the network infrastructure & software side of their business probably had its own dedicated site but i’ve sadly been unable to uncover any trace of it. 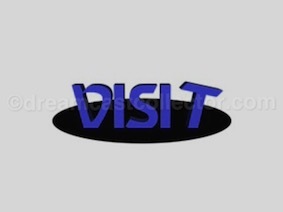 While i can’t conclusively confirm it i believe that VISIT at least in its original incarnation of a consumer development & publishing studio is currently defunct simply due to no new consumer software being attributed to them since ’03. In keeping with the generally niche & experimental nature of the company’s previous games it’s no surprise that their two Dreamcast titles continued on in this vein. In my personal, opinion by doing so showcases the greatest disparity between the quality of a single developer’s titles that was released for the system. The first of Visit’s two titles for the Dreamcast was ジャーマン or JAHMONG which was released on the 31st of August ’00 where it retailed for ¥4,800. 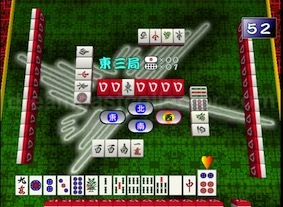 The game is arguably one of the most traditional titles developed by the company since it belonged to the Mahjong genre. VISIT managed to innovate in a number of areas not least by being the first consumer developer to implement voice-recognition in a Mahjong title. To take advantage of this unique feature you’d obviously need the optional Dreamcast microphone peripheral but the game is perfectly playable without it. JAHMONG’s entry on the Dreamcast catalogue has been archived and is linked to below. ©2000 VISIT All Rights Reserved. As i’ve mentioned before on previous articles for the site i can’t actually play Mahjong to any significant degree so that severely limits my ability to discuss the general gameplay that JAHMONG provides. 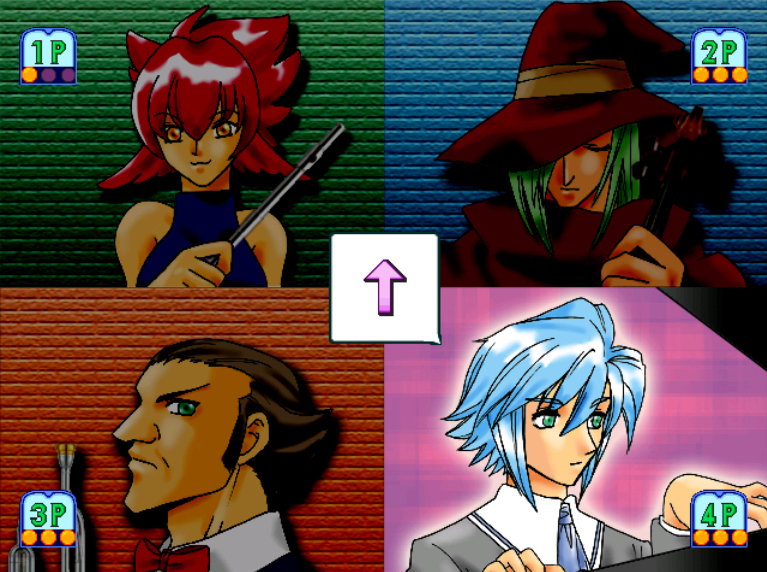 My opinion will have to be based on the games aesthetic style and the integration of the voice recognition software and how it compares to other Mahjong titles on the system since i can’t realistically comment on its gameplay. My exposure to the Mahjong genre in general is limited to the examples that are available on the Dreamcast so that again creates a rather limited example that’s represented. JAHMONG along with 電幻天使対戦麻雀シャングリラ by Marvelous Entertainment. Inc are the only Mahjong titles on the Dreamcast that eschews the more traditional staid presentation that seemingly features in the majority of other examples of the genre in general. 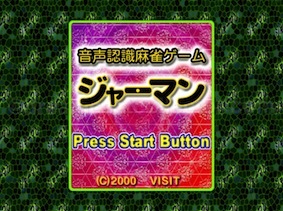 Personally, i think that JAHMONG has the best audio-visual presentation of all the numerous Mahjong titles for the Dreamcast this in part is probably due to the non-traditional nature of its audio-visual presentation. The game abandons the somewhat basic visuals that in my limited experience of Mahjong seem to be a staple characteristic of the genre. The game features backgrounds that use geometric animals similar in nature to the Nazca Lines found in the Nazca desert in southern Peru. These are well implemented without becoming distracting during gameplay and provide a unique look for the game. Honestly, i do have to wonder how Mahjong enthusiasts on the Dreamcast would’ve reacted to JAHMONG’s unorthodox presentation and whether it was appreciated or actually worked against it. Given that almost every other Mahjong title on the system adopted the traditional presentation usually found in genre titles it seems that this might very well have been the case. I’m not familiar enough with the genre to make any assertions to what is better but personally i prefer the more modern looking examples of Mahjong. VISIT obviously put some thought behind the integration of the voice recognition software that JAHMONG uses and your able to choose from a male of female voice if you don’t want to use your actual real voice during gameplay. The control options are quite extensive with full voice control being available to also offering a mixture of voice commands and using the Dreamcast pad to partially control the game as well as finally simply just using the Dreamcast’s standard controller as in any other game. The game’s voice input using the Dreamcast’s optional microphone peripheral seems perfectly fine and in my limited experience recognises the various voice commands to control the game perfectly well. Overall i can’t really experience the full potential of JAHMONG to a standard where i can judge it against its contemporaries. That said it’s clear that it’s a decent quality title that has high production values with a unique twist on a niche genre title. With no disrespect to other Mahjong titles on the Dreamcast i honestly think the combination of decent production values, a modern audio-visual presentation & well implemented voice recognition software makes JAHMONG among the better examples of the genre on the system. I’m curious whether Mahjong enthusiasts appreciated the various changes that Visit implemented as even with my very brief research it appears currently even now Mahjong titles seem rooted in a more traditional style. 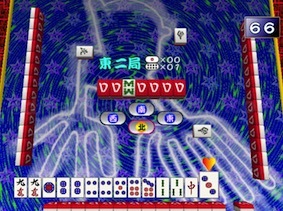 Since i can’t compare how JAHMONG’s gameplay relates to other examples of the genre i did try to find contemporary reports from users of JAHMONG but outside some basic product pages i was unable to find anything relating to either its gameplay or how it was received by Mahjong enthusiasts in general which is unfortunate. Since i’m not familiar with Mahjong it’s entirely possible i’ve missed some reviews or other information from former users of the game. What i really would’ve liked to have found was blogs or sites with first-hand reports pertaining to the online functionality of the game as even if i became adept at Mahjong i can’t experience this aspect of the game for myself. Realistically the reason why there’s not a wealth of information about the game is that it sold incredibly poorly with less than 2,000 copies reportedly sold. VISIT’s second title that they released for the system is truly something of an enigma for a variety of different reasons not least it was among the final titles known to published by the company. 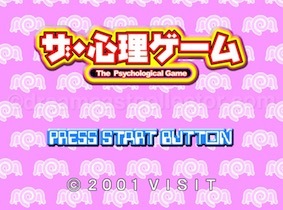 ザ・心理ゲーム or The Psychological Game was released on the 1st of February ’01 and again retailed at the same reduced price point as VISIT’s previous title JAHMONG of ¥4,800. While i had no prior knowledge of The Shinri Game franchise it appears that it was the company’s signature series with an impressive nine previous instalments on the Sony PlayStation and this tenth Dreamcast exclusive edition. Strangely given the fact it’s part of this franchise Visit doesn’t seem to officially acknowledge its existence in any capacity on their website to the extent multiple iterations of their published catalogue of works omit the game entirely. The only official acknowledgement i’ve been able to uncover was the games dricas site which was provided by SEGA which unfortunately hasn’t been archived. This lack of information for the Dreamcast version of The Psychological Game is a peculiar situation considering i could find plenty of information on the other entries in the series on VISIT’s archived official site. I can only conclude that with nine previous titles released in the Shinri series that there was somehow a demand for the software which made them a commercially viable endeavour that Visit was keen to capitalise on releasing regular new instalments. Much like the company’s previous title i tried extensively to find contemporary articles from users of The Shinri Game series as a whole and i did manage to locate a few reviews of the software which generally dismiss it as somewhat meaningless. I’ve been unable to find any that actually represent the target market that bought the titles at launch which seemingly must’ve existed as evidenced by the amount of titles in the series that were released. I’m completely aware that the series was considered very niche even in its native Japan and as such the franchise is virtually unknown in the West. The Psychological Game is a complete misnomer as there’s almost no actual gameplay to speak off in the software. The primary function behind The Psychological Game was seemingly the strange obsession of psychoanalysis. The software allegedly allows the user to take part in seven psychoanalytical tests in which the software would be able to determine various personality traits. Personally, i found it a particularly boring experience with no scientific basis and an audio-visual presentation more at home in a flash game of the turn of the millennium rather than a packaged retail title. To try to understand the concept behind The Shinri Series as a whole i did research other titles in the franchise and it seems they all performed a similar function relating to testing using psychoanalysis to determine various personality traits of the person using the software. Before i’d actually experienced The Psychological Game for myself i’ve had it in a pile of titles that for various reasons i never seemed to get around to trying. 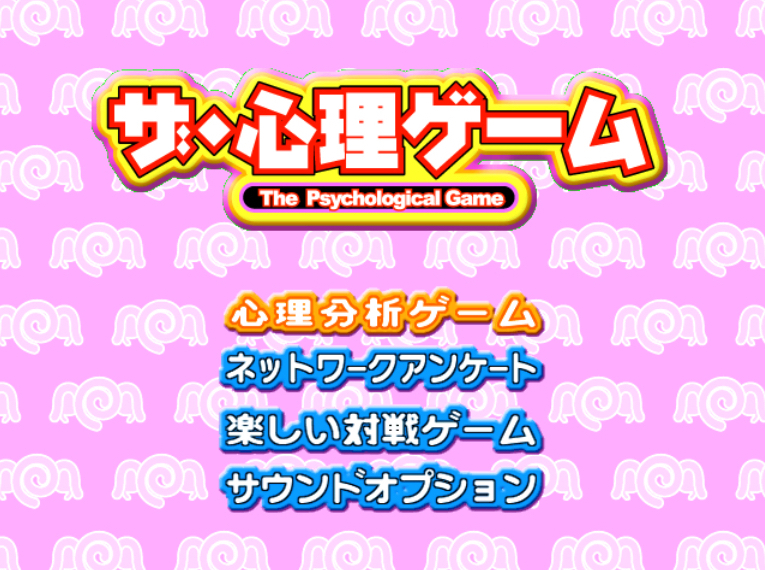 It was obvious that there was a distinct lack of information about the title so rather naively i thought of doing a translation or general user guide to The Psychological Game for others who might’ve been interested. The first problem i encountered with this plan was due to the nature of the software there’s literally no right or wrong answers as its all based on personal choice. While i could translate all the questions it soon became apparent the end result would’ve been a rather pointless affair. This leads importantly on to the second problem which unbeknownst to me before experiencing The Psychological Game is that in my personal opinion it’s one of the worst titles if not the worst to grace the Dreamcast’s library due to a distinct lack of gameplay. Just before i give my reasons behind such a bold statement i’ll just touch on why i believe The Psychological Game doesn’t feature more prominently amongst the worst known titles on the system. This i suspect is simply down to its virtual obscurity that precludes it from the notoriety it probably deserves. The Psychological Game begins with the lowest resolution logo’s i’ve seen on the system which is almost a harbinger of what’s to come. The main content provided by the software is ostensibly seven personality trait tests all of which are very simple affairs which include tests like yes or no, what would you do & what represents you best nothing remotely engaging and all with a distinct lack of interaction. Given that the testing is incredibly basic it means that your testing will generally be completed in under twenty minutes and certainly in my case you’ll probably wonder why you’ve wasted your time on such a meaningless endeavour. To be completely fair to VISIT the couple of PlayStation Shinri titles that i subsequently tried were equally as poor as the Dreamcast version content wise so i’ve reluctantly concluded that the series as a whole has generally poor production values as standard. The Dreamcast incarnation to its credit is noticeably better than the previous PlayStation entries in the franchise but technically its damning with faint praise with a sub-standard graphically & audio presentation for the system which is surprising given the company’s earlier title had decent production values. VISIT to their credit obviously recognised the Dreamcast instalment of their flagship series was able to offer a unique selling point that could take advantage of the hardware enhancements of the system. So, for the first & only time in the history of the franchise the Dreamcast exclusive version of The Psychological Game’s made use of its internet connectivity to allow users to upload their test results to VISIT’s servers. I’m not really sure what the intended purpose would’ve been as the software is hardly a true scientific endeavour. If like me you share the same opinion about the games main content of psychoanalytical testing in a commercial video game being an odd concept VISIT wisely chose to include three optional mini games. These featured more traditional forms of gameplay which are selectable from the game’s main menu screen and while i welcome variety there a strange inclusion. Unfortunately, they are all universally terrible featuring very basic simple gameplay that an earlier system from the 8Bit or 16Bit generations could easily provide but with faster, smoother & more engaging gameplay. Strangely they all have a different art-style which i suspect they were created individually and probably by different team members at different times. It might seem that i don’t appreciate The Psychological Game and it might seem cynical of me to suggest it but i wouldn’t be surprised to find their inclusion was simply to allow for a four-player specification on the packaging which in turn would’ve provided another unique selling point for the Dreamcast version of The Shinri Game. I can fully appreciate that i’m not the intended target market demographic for either of VISIT’s Dreamcast titles but i can’t quite comprehend the disparity between the gulf in quality from JAHMONG to The Psychological Game. With JAHMONG i can’t really appreciate the general gameplay but it’s obvious it’s a well-made title that has high production values throughout this contrasts with the company’s later title The Psychological Game which doesn’t feature any real gameplay and seemingly has minimal effort in its production. The budget feel of The Psychological Game is further exasperated by the fact it doesn’t support VGA which is a curious omission since their earlier title of JAHMONG did allow VGA output. You might’ve noticed that there is a gap in VISIT’s Dreamcast catalogue with T-43402M being absent. This is speculated to have been reserved for JAHMONG 2 which appeared on various upcoming release lists including importantly for JAHMONG 2 SEGA’s own official upcoming Dreamcast release list and even had a provisional release date of Spring ’02. While this would explain the missing catalogue entry of T-43402M i’m not convinced despite the reports of JAHMONG 2’s prospective release that it was to be the intended missing title and i’ll explain my reasoning below why i believe this to be the case. The main reason why i believe that T-43402M wasn’t designated for JAHMONG 2 comes from VISIT themselves. Their official site maintained a development diary which was quite frank in detailing the challenges faced by the studio and after The Psychological Game had concluded its development in late ’00 Visit never mentioned anymore plans to continue development on the Dreamcast. In-fact from late ’01 through to late ’02 the company detailed their experimentation with the PlayStation 2 development hardware in which they cryptically detailed their plans to port one of their previous titles to the system. After the Last Train was published in ’02 VISIT strangely returned to develop their last known title on the original PlayStation hardware. Probably in all honesty due to reduced licensing costs and the large installed user base providing the best chance of success at retail. The penultimate reason was that the intended catalogue numbers are generally issued as a placeholder before the intended games expected release which applied even more-so to third party software. I personally suspect that T-43402M was initially reserved for JAHMONG but in a combined game & microphone peripheral boxset much like other titles which were released in this configuration as they followed sequentially in their catalogue designation. The reason why the game never saw a release in this configuration was probably due to JAHMONG’s unique voice control not being a mandatory requirement for gameplay & the fact VISIT would have to pay a licensing fee to SEGA to include the microphone peripheral. This probably put paid to its inclusion and meant the game only saw release as a standard title rather than in a boxset configuration. The final and unfortunately most realistic prospect why JAHMONG 2 wasn’t a likely candidate for the catalogue designation of T-43402M was simply due to economic reasons. I do honestly believe VISIT did intend to release a sequel to JAHMONG if it had been a commercial success but lacklustre sales made that an unrealistic option and was likely cancelled before any development began. The fact VISIT never mentioned any Dreamcast development after The Psychological Game gives credence to this theory. While its complete speculation on my part i don’t believe JAHMONG 2 was intended to be the missing T-43402M as it would have been released a year after their previous title T-43403M The Psychological Game. So i personally, believe that the combined boxset is the most logical option although i don’t think the issue can ever be satisfactorily resolved. I’m not aware of any individual Not for Sale disc’s for either of VISIT’s titles nor do i recall any content relating to them on any compilation discs. As for other media again i can’t say i’ve ever seen anything for either title. I thought that if anything was to exist it would be for JAHMONG probably just a guide book but i can’t confirm it. As for The Psychological Game i’m not really surprised that nothing apparently exists as VISIT themselves didn’t seem to acknowledge its existence in any official capacity so clearly a wealth of promotional items was unlikely to have been released in support of its launch.